Make your Network Smarter ! REPL are at the forefront of developing products which introduce greater intelligence into power networks. The concept of a “SmartGrid” is now well known – driven by the changing demands on power networks such as bi-directional flow , expansion of renewable distributed generation, the grid needs to be monitored and controlled in new ways. A fundamental part of any Smartgrid is the need for accurate information at key nodes. REPL are pioneers in retro-fitable and new build cable accessory products which can detect faults , measure voltage and current or other key parameters which then allow greater vision and control. REPL developed and manufacture the SMART TERMINATION – a medium voltage cable termination which includes integrated voltage and current sensors which can be easily retrofitted into the existing networks to provide measurement, control and protection abilities. The highly accurate data can be used for billing, or in sophisticated power quality and cable health monitoring applications. The SMART TERMINATON is available in versions for both Air insulated and Gas insulated switchgear connections. REPL developed and manufacture the SMART FAULT PASSAGE INDICATOR (SFPI) – a device for installation in low voltage feeder cabinets to detect the passage of overcurrent caused by short circuit faults. The electronic interface unit includes short range wireless communication technology which allows the cabinet to be interrogated using a dedicated smartphone app , without need to open up the cabinet. The app records the device ID , and indicates if a fault has passed through that part of the network as well as previous history of overcurrent’s. 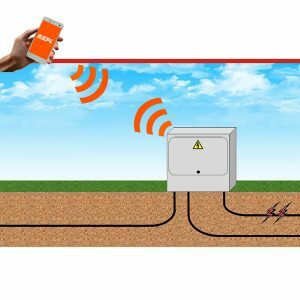 This allows location of faults to be identified and isolated much quicker.